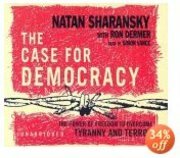 Natan Sharansky, the famous Soviet dissident and Jewish refusnik, writes eloquently about what it means to live in a fear society and how every man has a right to live in a free society. rather than the distinctions of democracies, capitalist societies, etc., the book dwells more on enabling people to be more free. Summation: this is a must-read book for anyone trying to understand the world today. Sharansky gives much of his own history from Soviet times and makes parallels to today’s world. this is available on audiobook which is a good medium for this book. This entry was posted in Books/Movies/Shows on July 25, 2005 by auren.